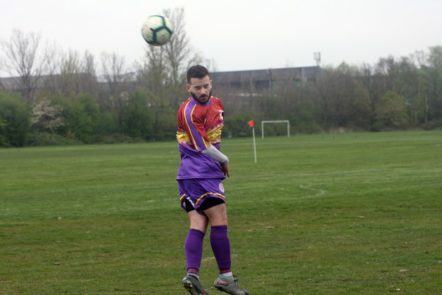 Saturday saw the Tons taking to the pitch for the first of three games in three days and it’s safe to say this was a bit less glamorous than the trip to Barcelona. 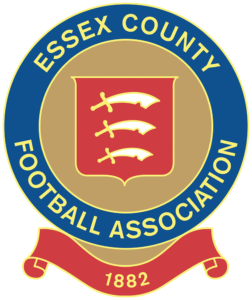 Since last Saturday’s sunny fixture at Eastfield FC the weather had taken a distinct turn for the worse. Plenty of layers were needed to keep the travelling support warm. However, the pitch itself was dry and while the clouds hung low, the rain stayed away. 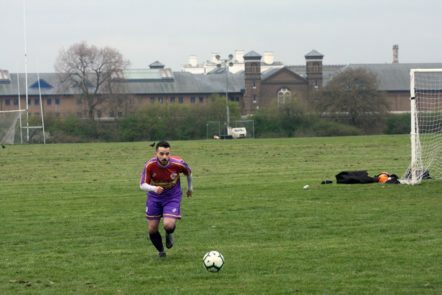 The location was about as basic as they come, a windswept expanse around the back of Wormwood Scrubs Prison. However, it was by a long measure the highest capacity ground in the league. So long as you weren’t concerned about visibility, you could easily fit a good half a million people in the fields around the pitch. Not quite all that space was needed for the 80 or so fans in attendance (not including dog walkers). After an 11-1 rout of Hereford Palace at the Stray Dog in November, the Tons decided to rest a number of their players for this return fixture, perhaps with an eye to a big week of games ahead. Goalkeeping coach Tolga Ulasan was taking a shift between the sticks for this game. He was joined by some other faces that have not been seen in a Tons shirt for a while including Tom Carding and Alby Miller. Meanwhile Eliot Crosbie was pushed up front to lead the line, and he was hoping to add to the five goals he bagged against Palace in our last meeting. The opening ten were a surprisingly close affair, with Palace showing that they were not going to be rolled over as easily as last time. Early chances came for Crosbie and Ellick Coleman who were both on the end of good deliveries from Stefan Nielsen. In both cases they didn’t have time to get a good shot away. 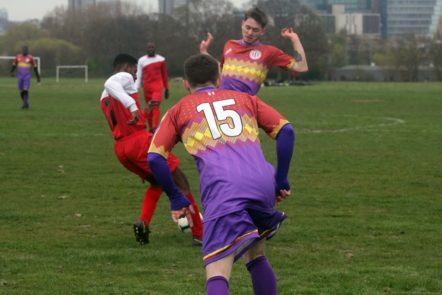 The first real chance came for Clapton on 9 minutes, when Nielsen got the ball in the midfield and left his Palace marker for dust. He was able to deliver the ball into Crosbie who hit the ball cleanly, only for it to go just to the left of goal. 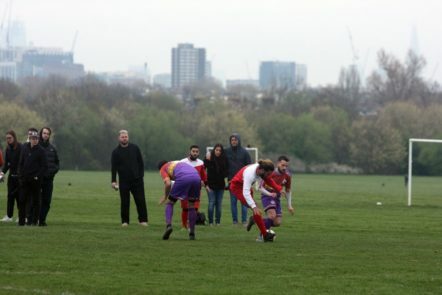 From the goal-kick Palace’s Tasila Mingwall was able to find some space around five metres outside the Clapton box and went for a long range effort. His shot went curling comfortable over the bar. 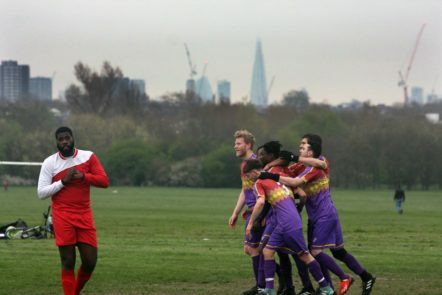 Clapton continued to apply pressure, but were struggling to finish their chances. Bogdan Panescu was robbed of a goal by a superhuman effort from the Palace keeper. The chance came because of a run from Crosbie, beating three palace defenders on the far left wing. His waist height cross to Panescu was volleyed perfectly, only to be stopped by a superb post to post dash from Palace keeper Steven Kennedy. The deadlock was finally broken just shy of the 30 minute mark. A Nielsen free kick from the middle of the Palace half resulted in a scramble in the penalty area. Through the melee, Prince Kwakye was able to get his foot to the ball. The strike wasn’t clean, but it was enough to trickle over the line and give the Tons the lead. Several opportunities to double the advantage came for Carding who sent two headed efforts towards goal, only to go just wide on one occasion and over the bar on another. 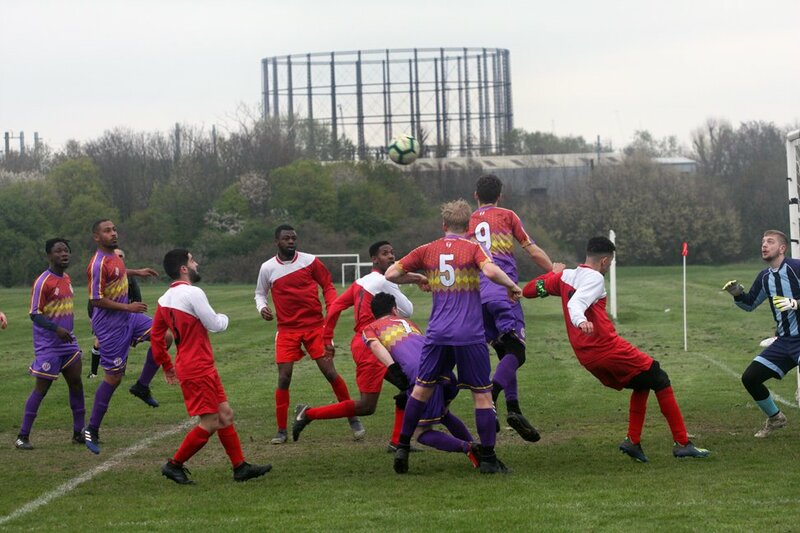 In the dying minutes of the half there was a call for a penalty after Palace’s Andre Cavaco was brought down in the Clapton box. However, the referee wasn’t close enough to see the incident and it went unpunished. Just before the half, Crosbie’s efforts in front of goal were finally rewarded. 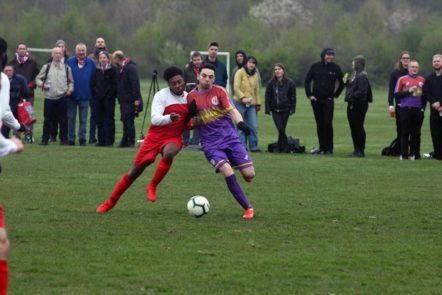 During a period of close play in the Palace box, several Clapton players got shots away only for them to rebound off Kennedy and his defensive line. 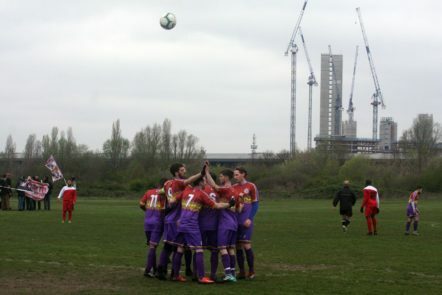 Finally on the third or fourth effort, Eliot got hold of the ball and struck it into the bottom left to send Clapton into the break with a two goal cushion. After the restart, Palace continued to dig in and play a tenacious game. They were nearly rewarded several times. Daishin Moise’s shot going wide of the goal. Followed shortly afterward with a run through by Cavaco, however he was also unable to convert. 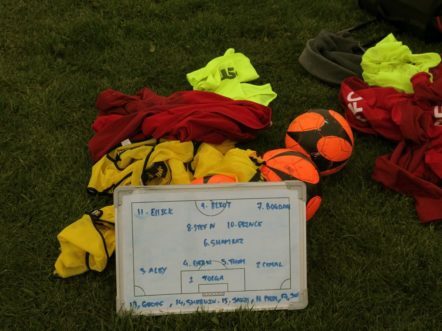 With ten minutes of the second half gone, Clapton made several changes in order to rest key players. Nielsen, and Panescu coming off for Geoff Ocran and Jon Akaly. The half continued to be a close-fought affair. With 70 minutes gone, Palace were able to reduce the deficit to 2-1. 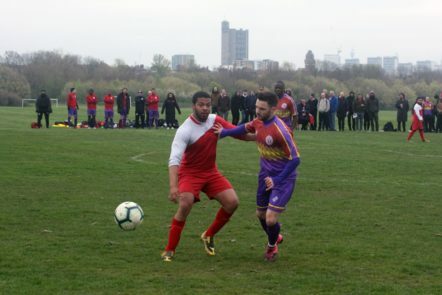 Alsan Kahn capitalised on a fumbled ball by Ulasan to knock in only the club’s ninth goal of the season and open the way to what would be the most unlikely of upsets. Hereford hopes were quickly dashed as Clapton immediately pushed forward from the restart. Akaly was able to feed the ball into Crosbie, who headed it straight into the centre of the goal to restore the insurance marker. Palace weren’t ready to give up quite yet, Mingwall got his foot onto a delivery into the Clapton area however struck it wide. With ten minutes to go in the game, Clapton finally finished it off as a contest. A curling cross from Cemal Agdelen found sub Sherwin Stanley. With plenty of space deep inside the box there was only going to be one outcome for our top goalscorer. 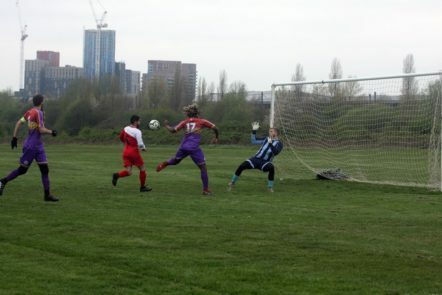 He duly finished it off, hitting the ball to the keeper’s right to make it 1-4. Palace tried to catch Clapton napping with a strike off the halfway line straight from kick off but their audacious effort came to nothing. A final opportunity for Clapton came in the last minute. 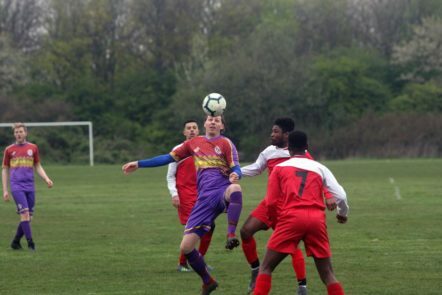 Carding headed a corner kick on target and was only denied his first Clapton goal by some quick reactions from keeper Kennedy. The final whistle blew seconds later. 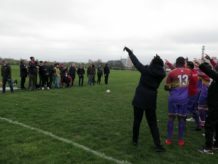 After the customary victory celebrations, players and fans alike scuttled off to the nearest pub to warm themselves up. After all, there were still two more matches to look forward to this weekend. 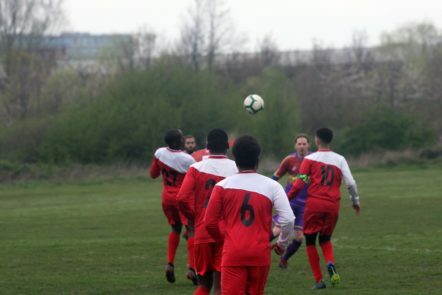 While Clapton were taking care of business at The Scrubs, second-placed, North West London signed off their season with a draw against league leaders Stonewall FC. 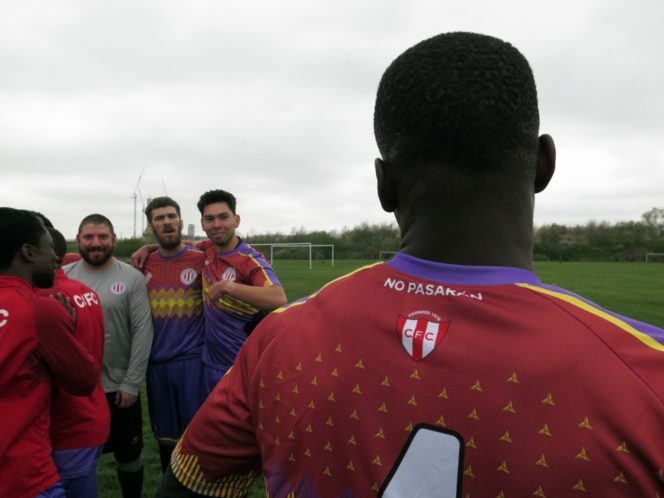 Fellow title challengers London Samurai were also only able to get a draw, conceding a rare goal at their own ground. 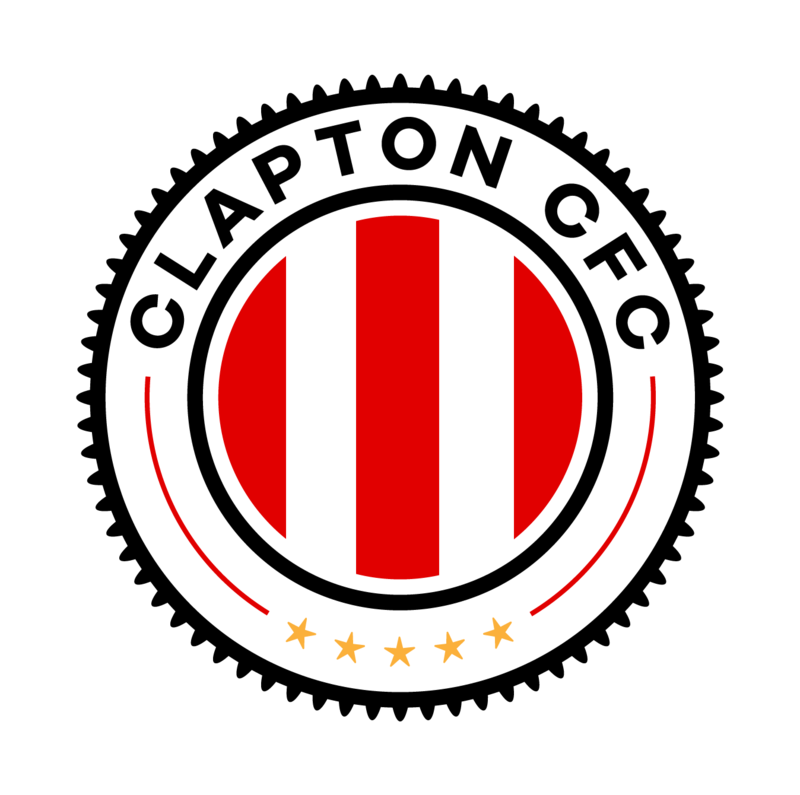 The results allowed Clapton to gain important ground on their rivals, meaning a top three finish is still very much in our sights. Two goals for Eliot gives his the honours.